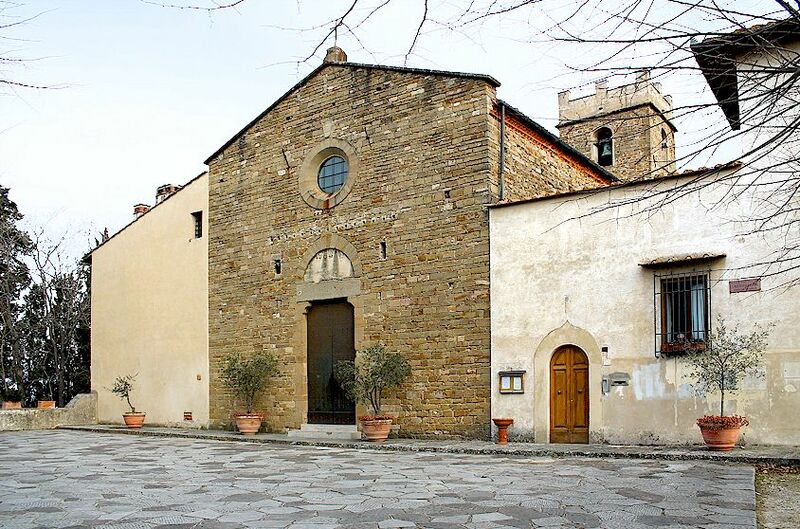 Cultural Tours of Tuscany: Santa Margherita a Montici: a place of mediaeval murder! Travels along the highways and byways of Tuscany, its cities, towns and villages. Santa Margherita a Montici: a place of mediaeval murder! Right at the summit of the hill called Montici on the outskirts of Florence, not so far away from the charming Pian dei Giullari district and behind the magnificent basilica and monastery of San Miniato al Monte, stands the romanesque church of Santa Margherita a Montici. Despite the beauty of this area, during the Middle Ages and specifically in the year 1350, there took place here one of the most barbaric and at the same time theatrical murders that ever happened in Florence. This event would be worthy of Hollywood scriptwriters if only the participants were not real people! The church of Santa Margherita a Montici near Florence. Let's follow what Luca di Totto da Panzano – basically one of the two protagonists of this story - has to say in his memoirs (published in Il Chianti nei libri di famiglia del Medioevo by Renato Stopani). This tragic event occured on the 13th of June, 1350, when Luca learned from one of his most trusted friends that Carlo Gherardini, the murderer of his brother and whom he had sought for the past four years long, was happily having lunch in Santa Margherita in Montici. Luca decided to go there immediately and try to lay his hands on Carlo to avenge his brother's death. The first thing Luca did was to get together as many men as he could and then, as soon as he reached the church, to lay down a siege. Luca was so speedy in making his arrangements that Carlo Gherardini had only enough time to take refuge at the top of the bell tower in an attempt to survive the very dangerous situation before him. The siege lasted until sunset, attracting hundreds of curious onlookers from the city, but no one could convince Luca to desist from his intention, not even the mayor of Florence. Around sunset, after several hours spent on the bell tower, Carlo decided to surrender and, as soon as he came down, he was killed by Luca and his people. Outdoor mediaeval play during the "Festa della Stagion Bona"on the 25th of April at Panzano in Chianti. 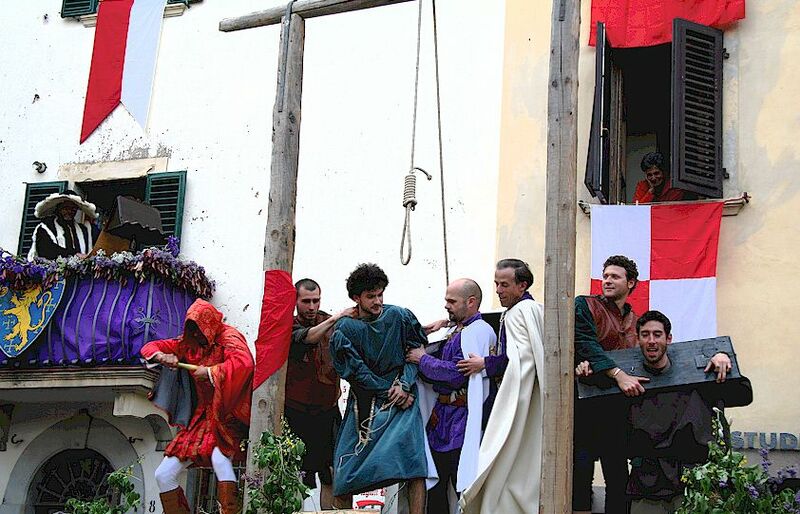 For almost 50 years, every 25th of April, in Panzano in Chianti, hometown of both Carlo and Luca, this tragic event has been relived, with some poetic license, in the form of a mediaval popular play, during the Festa della Stagion Bona. The 25th of April is also Liberation Day in Italy, and the costume parade and the play depicting the fate of Carlo Gherardini taking place at Panzano on this day are well worth attending. More about Panzano in Chianti. More about the Festa della Stagion Bona. Nicola Bernini is a licensed tour guide specialising in the Siennese and Florentine provinces of Tuscany. Nicola's scholarly tours allow you to enjoy and learn about the wonderful off-the-beaten track treasures of Tuscany. More about Nico's Tuscan cultural tours. All content copyright © Nicola Bernini 2013. All rights reserved. Tell your friends about my blog!